Tell me you haven't also been reading the Easter egg hunt disaster stories with fascination. Who are these horrible parents? Why do they care so much about their child finding the plastic eggs? What is wrong with our society? 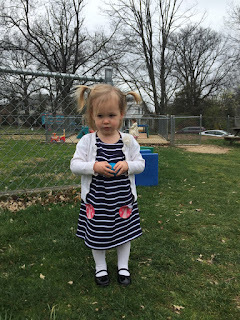 All these thoughts have gone through my head, yet on Sunday, while trying to cattle prod my two year old into participating in the egg hunt I started to see some of the parenting frustration that can lead to the crazy. Our church has a lovely egg hunt every year organized by the middle schoolers. They even hide the eggs for the toddlers inside a fenced in playground and keep the older kids away. The eggs for toddlers are filled with healthy snacks like crackers and gummies instead of jelly beans and chocolates, which is very thoughtful and I'm in support of until I'm trapped inside the toddler fence knowing Mr. Lipstick is devouring the jelly beans our four year old brings him and all I have are stickers and goldfish. Instead of watching a sugar-crazed four-year-old run like a mad woman from tree to tree and deliver candy into my hands, I was with my two year old, desperately trying to get her to pick up a plastic egg. Just one. Just get one plastic egg darling. It's right there... yes, pick it up, no, don't put it back. It's for you! With everything else in your life you yell "MINE" why not this? Just lean over and pick it... oh wait, another kid just took it. OK, let's pick up that pink one over there... Quickly, before the other kid gets it again... I suddenly felt sympathy for all of those egg hunt crazy parents out there. They probably were lovely people until they experienced the unending frustration of trying to make their two year old have fun. Littlest Lipstick had no interest in finding plastic eggs. Absolutely none. She sucked her fingers and looked at me with her skeptical "my mommy is crazy" eyes as I kept trying to convince her to pick up that blue plastic egg at her feet before another kid did. She obviously did not understand why we were standing next to a playground and she wasn't playing- and why I kept telling her to pick up items on the ground when usually I make her drop the pieces of trash-treasure she somehow digs up on any other playground. She stared at me like this was some sort of trap. I knew I couldn't pick up the eggs myself- that would be wrong. It was for the kids. But my kid wasn't participating- she was missing out on this moment! Her childhood was flashing before my eyes. This is it- her two year old Easter- it only happens once! She must find eggs! Plus, the eggs were EVERYWHERE. There was nothing hidden about them. All she needed to do was bend over and pick up the egg. Or turn around. Or go down the slide. Just going down the slide would knock down a few eggs. I could catch them in the basket and we could count that as finding them. She found one egg. She's not impressed. I wasn't alone. 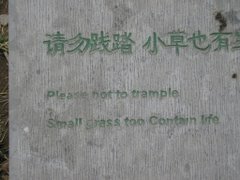 The playground was full of parents equally frustrated and toddlers equally confused. We all stood, laughing awkwardly, while trying to mentally will our confused children to just bend down and pick up the eggs. As though we've ever had luck with trying to mentally will a two year old to do anything. "Look! Over here! Can you find the egg? Where are they? Oh my goodness! What's behind the slide?" Nothing. Fingers kept being sucked. A few older kids who caught on to the game grabbed the egg in question before our young ones could figure out what's happening. Our kids didn't care- but somehow we did. It is physically uncomfortable to watch your child NOT pick up the egg in front of them. Parenting is hard, always. But there are times when we don't recognize just how hard it is. Standing there, watching a child not participate in what should be a very fun time is surprisingly difficult. And when we don't realize it is difficult- when we keep trying to fix it and force the situation instead of standing back and watching the show- we create a mess. As I pleaded with Littlest Lipstick to just pick up the **** egg I had to remind myself that this wasn't about me. I wasn't in charge of organizing her perfect childhood or making sure she finds her fair share of eggs. 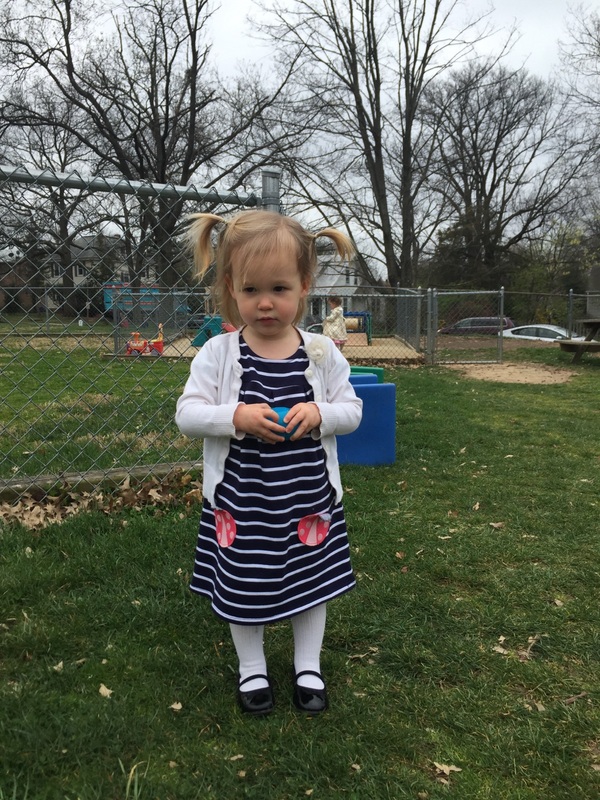 It's going to be OK if she misses some egg hunts or falls down or we don't get the perfect Easter picture. I can't do all of these things for her. I can't make it happen. We forget this as parents. We feel responsible for so many aspects of our child's life that it is hard to draw lines between what we can and cannot control. It's easy to criticize the helicopter parents until that moment when you are there yourself, trying to make your child's life perfect. Perfection isn't the goal for childhood. We need to stand back, take a breath, and let it be messy. As uncomfortable and frustrating as it is. *It should be noted that although she resisted collecting eggs at the hunt later on Easter she overheard me saying that we were out of eggs- meaning real eggs for cooking. She started yelling, "NOT YOURS MOMMY! MY EGGS!! I FIND! MINE!" like she has royalties on all the eggs that enter our house after rejecting eggs that morning. 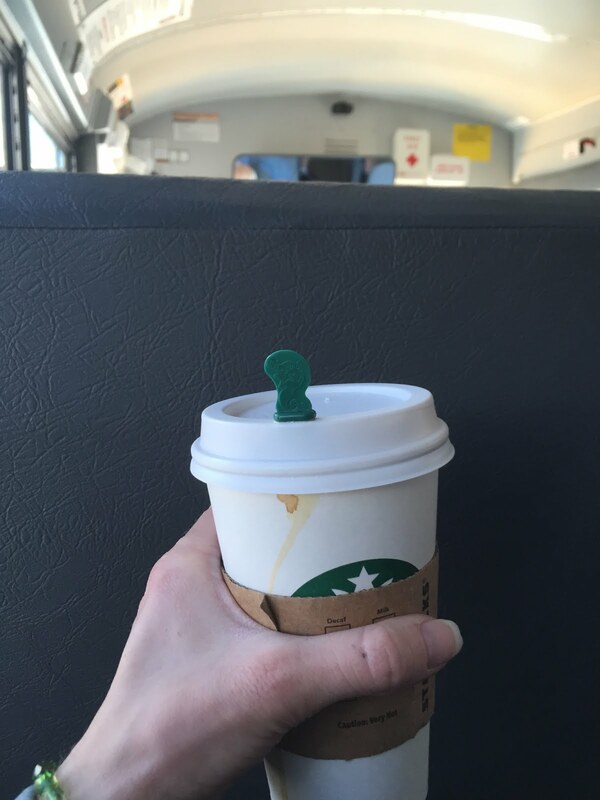 On Tuesdays I meet with a small group of fifth graders to follow the Unstuck and On Target curriculum, which addresses executive functioning skills such as using coping skills, creating plans around set goals, and dealing with the unexpected. When I do this group with younger grades the coping strategies usually center around taking deep breathes or going to get a drink of water. The much younger grades can even refer to Daniel Tiger and Elmo's coping strategies of belly breathing or counting to four before you roar. This group of fifth graders however is more mature and somewhat beyond my typical go-to list. 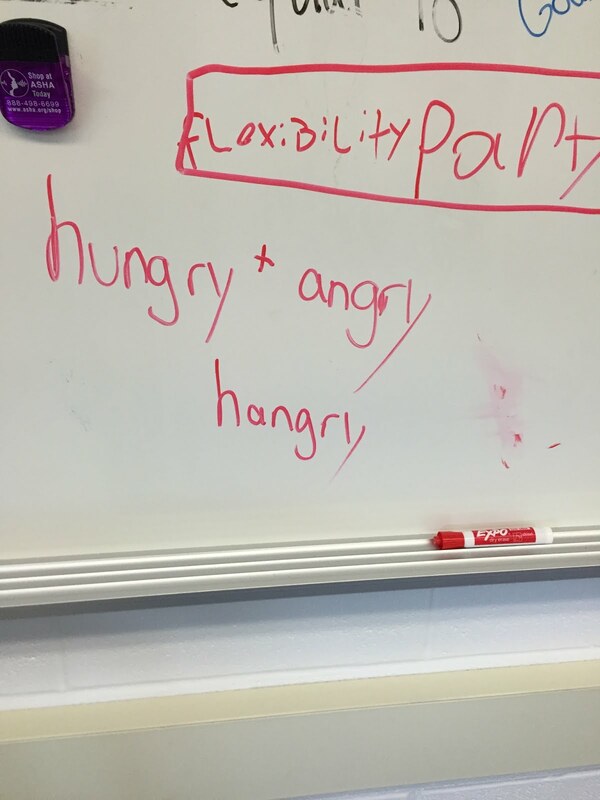 As I listened to one student talk about how her family responds to her irrationality with food because she often forgets to eat I found myself describing the term 'hangry'. Because, let's be honest, this is a common adult problem. If you are a person who forgets to eat and then gets cranky you should probably be able to identify when you get 'hangry' and be able to fix it yourself. Just as much as you should know to take a deep breath or get water when you are angry in kindergarten. I once worked for a women who often forgot to eat. It was commonly known that you should only approach her 20 minutes or later after meals. Anywhere between 11:00 am and 1:30 pm was a danger zone because most likely she hadn't eaten lunch yet and you would be yelled at. Wait until after she'd eaten? She was lovely. Hangry is a real thing. We should all be able to recognize it in ourselves, right? 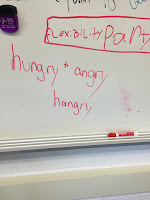 It was not a term I expected to be describing to a group of fifth graders, but it seemed appropriate at the time. As I wrote it on the board another student looked at me in horror. "Isn't that just comfort eating?" he asked, "Are you now telling us to eat our feelings? We're all going to get fat." The other group members looked at me curiously, as though in their mind I was suddenly the witch in Hansel and Gretel, out there trying to fatten up children. Cue the talk on our individual differences in our coping strategies and how I am NOT telling them to go home and eat whenever they are angry or frustrated. Listen to your body, know yourself, and no, don't just eat your feelings! But don't forget to eat! Daniel Tiger anyone? The whole stumbling discussion found me wanting my own coping strategy- Starbucks. As both a parent and a teacher I have found nothing better than introducing a child to a new book and helping them connect to it in meaningful ways. As a parent however, I've found it much harder to be meaningful in how I incorporate books into our family's life. I read what my child brings me, and then we move on to the next book. 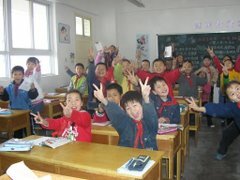 Inside the classroom setting I have watched how the careful introduction, teaching, an d encouraged engagement with a book strengthens children's developmental abilities, particularly in the area of language. I finally realized I can enjoy watching my own children's development blossom with activities centered around books as well. It does not need to be fancy or perfect - my children, like yours, will enjoy any opportunity to read and play with me. I've started a weekly newsletter to give parents ideas of how they can enjoy in-depth literacy-centered play with their children to support their development. Each month will focus on one book, with a new activity each week that addresses your child's language, sensory, fine motor, and social/emotional development. Subscribe here to get these activities straight to your inbox!